Elmwood Cemetery contains the graves of the Dalton Gang bank robbers and the town's defenders from the gun battle of October 5, 1892. Witnesses describe odd noises, shadows that chase them, and uneasy feelings. Completed in 1904, the grand Brown Mansion is said to be haunted. Although the staff complain to have no evidence of the haunting, local tales tell that when the building spent several years vacant, with the power turned off, glowing green lights could be seen coming from the mansion grounds. A reported misty white figure that flits through the trees as well as unexplained voices, laughter, and chain-rattling make this an eerie spot, and a hangout for town teens. The old one-room schoolhouse for Native American children was built in the early 1900s. Legend has it that if you write your name on the blackboard and leave, when you come back later, the board will have been wiped clean by unseen hands. Allegedly haunted by a cowboy called Zeke who was shot and killed by the innkeeper in its stagecoach heyday. People claim to see the apparition of a cowboy, hear the jangle of spurs and also claim that objects move on their own. 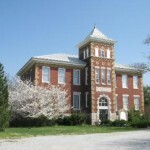 Legend has it that there is a grave of a witch toward the back of this cemetery, and some claim that apparitions, voices, and strange sounds will come from the area, especially around the hour of 3:33 a.m.
Missouri Southern State University has a ghostly Dark Lady who is known to move objects and create cold spots. Some also maintain that the Billingsly Student Center is haunted. Nighttime security guards and other employees reportedly have witnessed a ghost that roams the halls in the museum. Brady Theater, a public assembly facility since 1914, is rumored to be haunted by the ghost of opera singer Enrico Caruso, who performed there in 1920. Local legend has it that it was here that he caught the cold that led to his 1921 death by pleurisy. 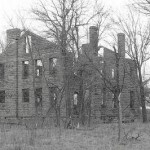 Kendrick Place, or Kendrick House, was built in 1849 and is said to be haunted, perhaps by a slave woman who was hanged from a nearby tree dring the Civil War. 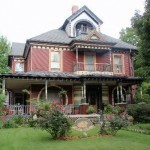 The ghost in residence at this early-20th-century house is said to be a male whose cigarette smoke smell fills the dining room and parlor when he is around. The spirit is thought to be that of Albert Carmean, a former owner in its early days. At this art museum, some say the statues' eyes follow you, and if you look closely, you may notice their heads actually turn! Reports also mention lights that turn on by themselves up and down the hallways when no one is there. One of Ponca City's oldest buildings, the theater is the site of disembodied footsteps, disappearing apparitions, and the sound of Native American drums. To add to the eerieness, a stain on the ceiling resembling blood is said to mysteriously reappear whenever it is scrubbed clean or painted over. A Ghost a Day: 365 True Tales of the Spectral, Supernatural, and...Just Plain Scary! Three floors of exhibits detail the town's past, but visitors may see more than museum artifacts here. Phantom voices and strange flitting forms have been noticed here, and ghost investigators have captured electronic voice phenomena. 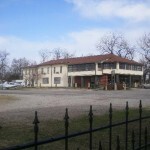 The 101 Ranch was a cowboy hangout in the early 1900s, and legend has it that ghosts remain here from that time. Will Rogers was among its guests. Witnesses say melancholy cowboy melodies and residual phantom voices can be heard around the site. According to witnesses, disembodied voices chat, footsteps stroll across the stage, and chairs move from place to place -- all while the area is empty of people. Living ones, anyway.